Does the thought of sweet and tangy cherries bring a blast of summer to mind? Then February is the perfect time to delight in all their goodness. And while life may not give you a bowl of (fresh) cherries this season, pit-free frozen or dried options are plentiful and easy to add to any dish. Cherries, including cherry juice, contain nutrients with surprising power. The benefits of this small but mighty fruit are known to help ease the pain of arthritis and inflammation, lower the risk of gout attacks, and help you sleep better. 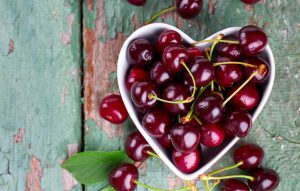 Take the chill out of February and celebrate National Cherry Month by trying any or all of these healthy cherry recipes. The prep time involved will be well worth the effort when you serve this simple, sweet treat. If you use frozen cherries, the pie will have a fun purple hue. To make ahead, cover with foil and freeze for up to 1 week. 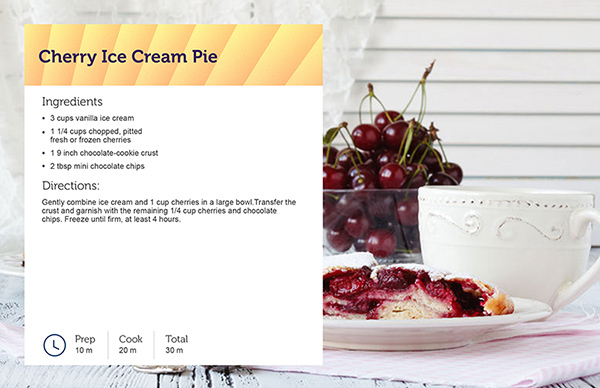 Gently combine ice cream and 1 cup cherries in a large bowl. Transfer to the crust and garnish with the remaining 1/4 cup cherries and chocolate chips. Freeze until firm, at least 4 hours. These popcorn balls are spiked with chocolate-covered pretzels and dried cherries for a unique twist to an old-fashioned favorite. Plus, the peanut or almond butter adds a satisfying bit of protein. Great for any time of year. Put popcorn in a separate large bowl. Combine agave and peanut butter in a small saucepan. Cook over medium heat, stirring gently but constantly. As soon as the mixture starts to lightly bubble, cook, stirring constantly, for 15 seconds more. Immediately pour the mixture evenly over the popcorn; gently mix with a wooden spoon or spatula until well coated. Gently stir in dark chocolate-covered pretzels and chopped cherries. Dip both hands into ice water. Quickly press small handfuls of the popcorn mixture firmly into 2 inch balls. Place balls onto prepare baking sheet. Dinner will be delectably different when you change up your typical pork entrée presentation. This recipe’s rich, savory sauce makes this an elegant dish any night of the week. Trim visible fat from pork chops. Sprinkle with salt and pepper. In a large nonstick pan, warm 1½ tsp of oil over high heat. When pan is hot, brown chops on both sides, about 2 minutes per side. Remove chops from pan and set aside. Over medium heat, add remaining ½ tsp of oil and diced onion. Cook and stir until onion softens, about 5 minutes. Add red wine. Cook and stir 1 minute to loosen the flavorful brown bits and mix them into the sauce. Add tarragon and cherries. Cook and stir 1 minute to blend. Return pork chops and any juices to pan. Cover and simmer 9 minutes to thicken sauce and until pork chops are fully cooked (to a minimum internal temperature of 160 °F). Serve immediately. Fresh cherries will be in season again before you know it. Then you can try picking your own to use in these tasty treats. Until then, these recipes will be perfect to start testing your new creations! Explore the Best Foodie Travel Destinations in the U.S.